Jim Henson felt right at home on late night television, and he had close ties to NBC. At the start of his career in the 1950s, his five-minute Sam and Friends show usually aired twice a day at 6:25 pm as a lead in to the Huntley/Brinkley Report and then again at 11:25 pm, as a lead in to The Tonight Show. It was on the local Washington NBC affiliate, WRC, and the people at the national network in New York soon became aware of Jim’s quirky show that was getting big audiences in Washington and then delivering them to the network shows. Steve Allen, the first host of The Tonight Show, was quick to see the tremendous appeal of The Muppets and hosted them on his show as early as 1956. They also started making numerous appearances on another popular NBC show, The Today Show, which led to the Henson Family’s move to New York in 1963. After Steve Allen, The Muppets appeared with the second host, Jack Paar, twice, and then during Johnny Carson’s long run, Jim and his team appeared at least 17 times. The January 13th, 1966 appearance was typical of what The Muppets were doing on variety and talk shows of that period. Jim had a repertoire of bits that he, Frank Oz, Jerry Juhl, Jerry Nelson and Don Sahlin developed and rotated for the different appearances. The extraterrestrial “Sclrap Flyapp” was performed in several versions on many shows during the 1960s. [See 9/26/1969 entry for a description and images.] “Money”, a satirical song by Stan Freberg and Ruby Raskin, was a piece going back to the Sam and Friends days when, at that time, his characters lip-synched to a record by Mel Blanc. 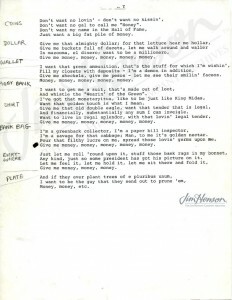 A send-up of the money-hungry, it was a great song for Jim as he enjoyed parodying the business world and the quest for the almighty dollar (while also recognizing the artistic freedom gained from financial success). He even created a tongue-in-cheek Shrine to The Almighty Dollar that hung in his office. By 1966, Jim was singing the song himself, in the character of Rowlf the Dog, who was just starting his career as a spokesdog for the most corporate of companies, IBM, and who would become expert at poking fun of corporate America. 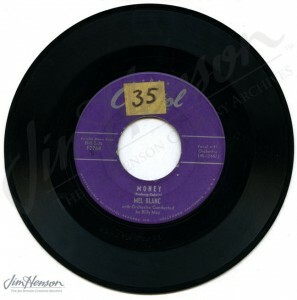 Jim Henson’s 45 rpm record of “Money” performed by Mel Blanc. 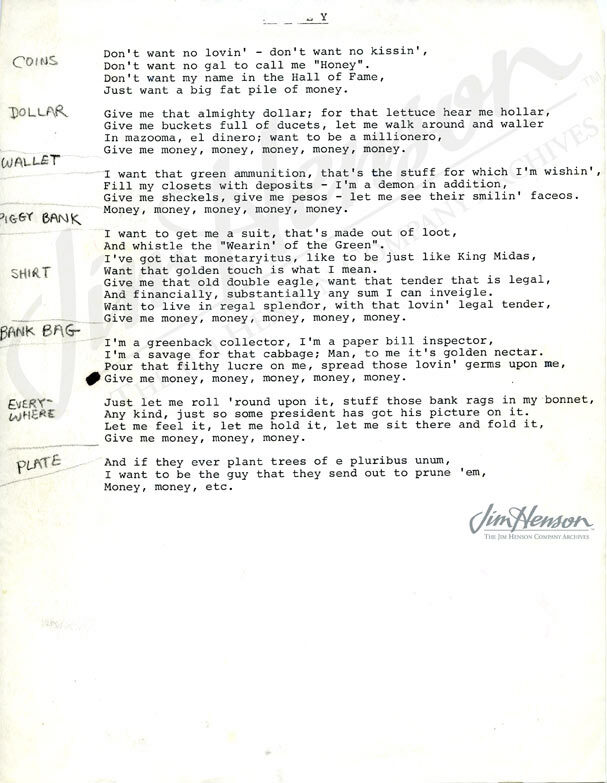 Jim’s “Money” lyrics page with props noted to the side, mid-1960s. Rowlf replaced George Washington in a 1968 IBM meeting film. This entry was posted in 01-January '66, Appearances and tagged Don Sahlin, Frank Oz, Jack Paar, Jerry Juhl, Jerry Nelson, Johnny Carson, Mel Blanc, Muppets, Rowlf, Ruby Raskin, Sclrap Flyapp, Shrine to the Almighty Dollar, Stan Freberg, Steve Allen, Today Show, Tonight Show. Bookmark the permalink.